Won’t someone please think of the Pikachus? Video from last weekend's Pokemon festival in Songdo, South Korea, shows a dancer dressed as the character from the animated series struggling with the costume before being tackled and pulled off stage. 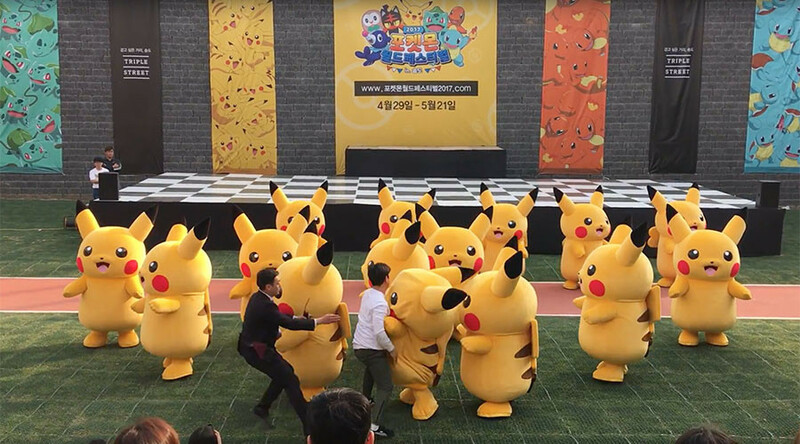 The bizarre scene occurs during an equally strange Pikachu dance show in which a 15-strong group of the critters plod around a stage to a medley of terrible pop songs. About a minute into the dance, seemingly overawed by the occasion, the lead Pikachu begins to flounder as the bright yellow costume visibly deflates. The unfortunate Pokemon is then unexpectedly rushed by two men dressed in suits. And, as though expecting one of the character’s famous electrical attacks, a further five men appear as back up and forcefully usher poor Pikachu away from his companions. The rest of the troupe, meanwhile, continue the routine as if nothing has happened. Towards the end of the quirky spectacle the fallen idol is guided back towards the rest of his group, but fails to make the cut as the costume once again starts to deflate. Clearly unimpressed with their underperforming star, the suited men quickly guide the hapless Pikachu towards the back of the arena.